Cryptocurrency markets are in constant turmoil. Prices vary wildly during a single day, let alone a week or month, and excellent investment opportunities sometimes last for just a couple of minutes. As such, having access to accurate cryptocurrency market information is essential for day traders and holders alike. But information overload can be a major issue for anyone who has invested in more than one cryptocurrency. What cryptocurrency investors need is a convenient portfolio management solution. This solution should be capable of tracking all cryptocurrency investments in real time and on the go. 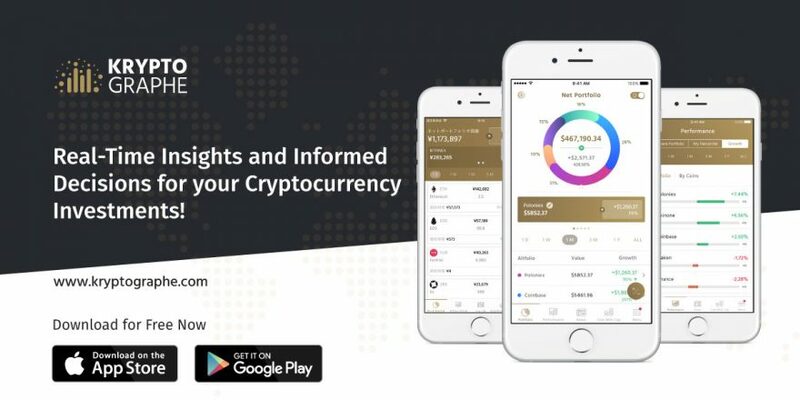 This is where crypto portfolio tracker KryptoGraphe comes in, offering the convenience of a modern mobile app together with the advanced features and useful insights of a mature investment platform. In a nutshell, KryptoGraphe is a free cryptocurrency portfolio tracker for Android and iOS devices. Its purpose is to help cryptocurrency investors keep track of their investments. Also provide them with all the information necessary to make wise investment decisions. KryptoGraphe achieves this while being extremely user-friendly. Thanks to its modern user interface and support for 13 languages, with more to be added in the near future. Despite boasting several advanced features, KryptoGraphe never overwhelms its users with too much information. Instead, it puts the user in the driver’s seat. Thus, making all key insights available with a simple tap on the screen. Because there are now over 2,000 cryptocurrencies, many investors struggle to know exactly where their portfolio stands. Despite spending a considerable amount of time on portfolio management. Such investors are making one crucial mistake: they use cumbersome tools, such as Excel spreadsheets. Instead of an automated portfolio management tool like KryptoGraphe. Thanks to its support for several of the world’s largest exchanges, including Coinbase, Kraken, Poloniex, Bitfinex, Binance, Bittrex, Hitbtc, Wex, Quoinex, KuCoin, BitBay, Cryptopia, Bleutrade, Coinmate, Bitmex, Qryptos, Luno, Dsx, TheRock, Bitstamp, Gemini and Huobi and many wallets, KryptoGraphecan automatically add all your cryptographic assets and keep track of them in real-time to make your life easier. What’s more, KryptoGraphe parses through historical data during the import process. Which means that you can see not only where you stand from the moment your portfolio was created, but also from the moment your cryptocurrency journey began. Of course, it’s also possible to add cryptocurrency transactions manually. Also you can include a short description of each transactions you always know why the transaction took place to begin with. KryptoGraphe advocates the philosophy of preferring safe and informed investments, which most successful investors in the world share. To make an informed investment decision, one needs to have access to key market information. KryptoGraphe over-delivers in the best way possible in this regard. Besides listing the market capitalization of all cryptocurrencies tracked by CoinMarketCap, KryptoGraphe also allows you to compare the performance of your crypto portfolio against other investors. You can see how the top 25 percent of investors are doing, compare yourself with investors. The investors who have a portfolio size similar to yours, or see how other investors in your country are doing. KryptoGraphe even shows how your portfolio is doing as a percentile score. Allowing you to accurately judge whether our successes and losses can be attributed to something other than market fluctuations. KryptoGrapheemploys a team of experienced news consolidators who work around the clock to bring you the latest cryptocurrency news. Before it catches the attention of mainstream audiences. Knowing what’s happening in the cryptocurrency world ahead of everyone else allows you to accurately predict future market movements and capitalize on mass hysteria and excitement. Each day, KryptoGraphe publishes between 3 and 5 news stories, rivaling even some of the largest cryptocurrency news outlets. Having access to both portfolio information as well as important news stories makes the often-confusing world of cryptocurrencies seems much less daunting and far more filled with tremendous opportunities. KryptoGrapheoffers an option for you to generate a Profit & Loss report to help you understand how your investment has been performing over the selected period. It clarifies in detail of your Profit or Loss position. Understanding the difficulty faced by most crypto investors to calculate and figure out the potential tax implications, KryptoGraphe helps create a Tax basis report which summarizes your transactions in the financial year. If you would like to always know how your own personal cryptocurrency portfolio is doing and how it compares with cryptocurrency portfolios of other investors, visit the official website of KryptoGraphe, where you can find download links for both Android and iOS devices. Note: This press release is for an informational purpose only. Coinpedia is not responsible for the accuracy of the content provided in the article. Thereby, readers are advised to consider the company’s policy & T&C before making any investment.